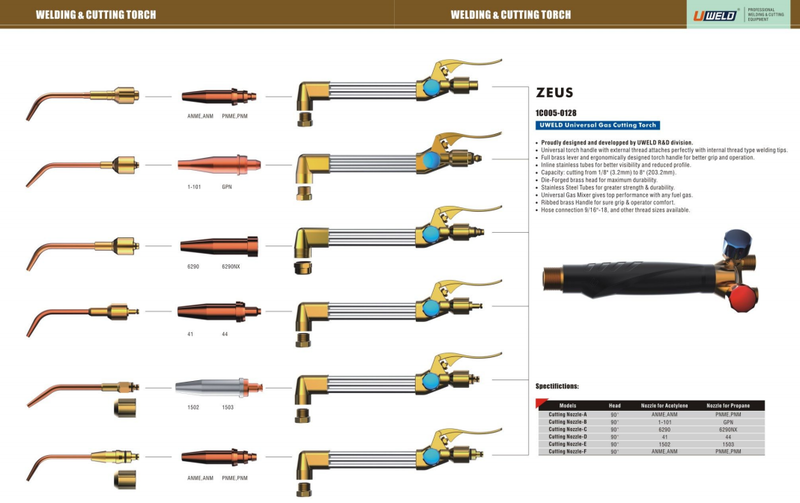 Product categories of Gas Welding Cutting Torch, we are specialized manufacturers from China, Gas Welding Cutting Torch, Gas Cutting Torch suppliers/factory, wholesale high-quality products of Gas Welding Torch R & D and manufacturing, we have the perfect after-sales service and technical support. Look forward to your cooperation! Gas Cutting & Welding Torch regards the torch handle as the foundation, according to the different demands, matching different types of Cutting Nozzle, welding nozzle and heating nozzle, can perfectly realize the work of cutting, welding and heating. Oxygen acetylene Cutting Torch uses a threaded connection structure, so it is not necessary to remove the handle when changing the operation, so that the transformation of the welding operation becomes faster. Cutting capacity: cutting from 1/8"" (3.2 mm) to 8"" (203.3 mm). Die-Forged brass head for maximum durability. Stainless Steel Tubes with strength and rigidity . Universal Gas Mixer gives top performance with any fuel gas. Ribbed brass Handle for sure grip & operator comfort. Hose connection 9/16"-18, and other thread sizes available.